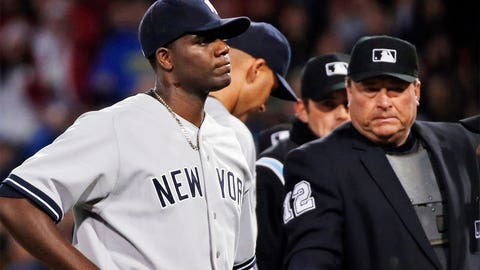 Was Yankees starter Michael Pineda cheating? Should he get suspended? If so, for how long? What in the world was Michael Pineda thinking Wednesday night? Nothing like adding to the Yankees-Red Sox rivalry, huh? If you missed it, the Yankees starter was ejected in the second inning for using a foreign substance, which was on his neck. And how about Albert Pujols? Five hundred career homers. Crushing the ball like he used to when he was in St. Louis. It’s Thursday and that means Rob Neyer is here for a live chat. He might talk about Pineda? He might discuss King Albert — how many homers do you think the 34-year-old slugger will finish his career with? Or you can chat with Rob about his most recent columns: The battle over the battle over home plate is worth fighting and Revisiting the Tommy John surgery epidemic. Feel free to comment or ask your questions below ahead of time … and come on back for the live chat at 1:30 p.m. ET.